I think it is safe to say that Raspberry Pi has made a dent in the maker movement. This program allows students to learn programming skills and create technology-rich projects that do not break the bank in the process. At the Raspberry Pi + iPad session, Mike Amante did a great job sharing his experiences with the device, explaining how he is using the technology with his students, and expounding on his plans to expand the program in the fall. Two representatives from the Raspberry Pi Foundation surprised the attendees at the end of the session to share news about Picademy USA. ■ Would you want to spend all day in your own classroom? One of the hardest things for many educators to do is build their Professional Learning Network (PLN). Taking that first step from picking the right social media platform to venturing out of the four walls of the classroom can be scary, but it’s absolutely necessary to grow as an individual. The session, The Passionate PLN, by Jessica Raleigh (@TyrnaD), was a very informative, hands-on experience that introduced Twitter to everyone as a way to connect and make a difference. One highlight from Jessica’s session was learning how to connect with The Breakfast Club (@BFC530) on Twitter and use their hashtag (#BFC530) as a means for participating and asking questions in a Twitter chat. If you are looking to build your PLN and connect with others, you can check out this group every weekday morning at 5:30 am EST and MST. 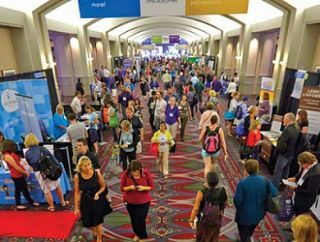 The ISTE conference is a good destination because it has something for everyone and consistently provides a variety of sessions. If you are an educator looking to participate in an event with options, and you want to grow your PLN and meet like-minded peers, I would recommend educating your school boards and administrators on the opportunities ISTE has to offer. Finding local events, lunch-and-learns, and Twitter chats, and meeting your colleagues for coffee on a Saturday morning also provide collaborative time and opportunities for connections to help you grow professionally. Get out of those four walls and see what others are doing and share!